Being laid up in a hospital bed is the absolute worst experience for any athlete. Any form of injury presents an unexpected disruption to training regimens, the rhythms of preparing for competition, and just life in general. This experience can be gut wrenching because all of a sudden the game has changed. There are now a whole new set of rules and a truckload of new expectations to unpack. The unknown is the worst part. 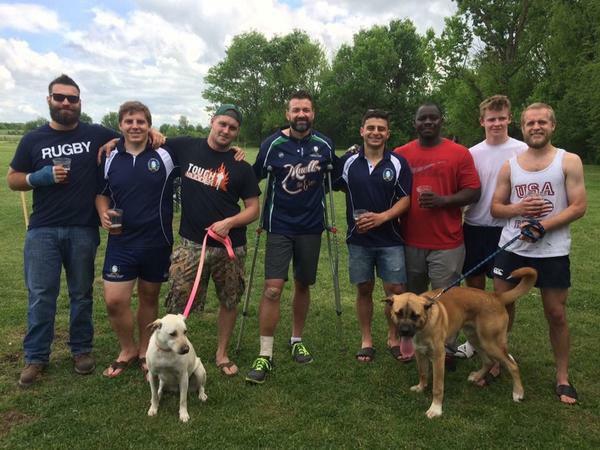 This article is Part II of a series exploring all the facets of what it takes for an amateur athlete to return to rugby following a traumatic leg injury. In the first segment – Traumatic Phase – I shared my personal story of sustaining a spiral-displaced compound fracture to my right tibia and fibula and the early medical and surgical intervention experience. Here I will transition to the Immobilization Phase and break down both the mental and physical challenges of preliminary rehabilitation and offer some insights to maximize your recovery during the process. For every athlete competing at the amateur level, this phase will require an immense amount of personal discipline and internal fortitude. To be frank, your journey back to the rugby pitch will only be successful if you have the stubborn guts for it. And it is this phase in particular where the outcome will be won or lost. During the inflammation period, swelling at the injury site is caused by the accumulation of fluids as the body attempts to flush irritants and control the tissue damage. This response while necessary, also needs to be managed so the tightness does not create so much pressure that it inhibits circulation. Rest – This is the hardest part. Because despite being immobile it is incredibly fatiguing to go from a performance regime at a competitive sporting level to physically stagnant. Your body’s stress hormones can also lead to a high level of irritability and inability to get comfortable. Creating a routine can help. Get up at the same time every day, eat at the same intervals, keep a routine to your daily hygiene and go to bed at a set time. It sounds counterintuitive, but resting effectively demands some hard work! Ice – Get yourself a medical grade ice pack which will minimize the condensation and keep your wrap dry. It is recommended to limit application to no more than 30 minutes at a time every 2 to 3 hours. Compression – Again, a medical grade compression sock is going to be most beneficial for use. The traditional ACE wrap provides inconsistent pressure over the injury site. Compression serves two purposes, to provide stability and support to the injury site as well as restrict the expansion of the soft tissue due to swelling. Elevation – To achieve proper positioning, the affected injury site must be at or near heart-level. This will make assist in the effort for full circulation of blood and keep oxygen and nutrient rich blood continuously flowing through the damaged leg. In the inflammation period you should not extend the amount of time without proper elevation for more than 30 minutes. As the inflammation period passes, the body transitions into the repairing phase. This involves the growth of fibrotic scar tissue in and around the injury site. This is a lower grade tissue that lacks the structure and elasticity of healthy tissue, resulting in restricted flexibility and range of motion. Beyond the affected injury site, pain, tingling and stiffness can also radiate to other tissues and structures along the kinetic chain. In my case, I experienced feelings of pain and tightness from my ankle all the way up my leg past my knee. There is some evidence to suggest that soft-tissue injuries can heal faster when the body has greater oxygen carrying capacity caused by an increase in nitric oxide. Ruck Science offers two such supplements, in the form of nitrate powder (Beet Elite) and our nitric oxide booster (NOxide). Obviously how you treat your body during the immobilization phase is very important but equally significant is what you are putting into your body. Again, this is not the time to get lazy! How disciplined you are in your nutritional approach to recovery will also play a huge factor in the quality and efficiency of your rehabilitation. While you may initially experience a dramatic drop in appetite, it is essential that you continue to provide your body with healthy nutrients and proper hydration. During my first week post-op, eating full meals was difficult for me. My wife created a high-calcium, high-protein, high-anti-oxidant smoothie concoction that got me over the hump. Calcium and Phosphorus are the two primary minerals found in bone. In the form of calcium hydroxyapatite crystals, this compound helps regulate the elastic stiffness and tensile strength of the bone structure. A healthy diet should take care of adequate Phosphorous levels, but increasing Calcium can be supplemented. 4 One dietary supplement I immediately implemented into my daily regimen was Jarrow Formulas BONE-UP. A 2010 research project led by Joseph Lane, M.D., professor of Orthopedic Surgery and chief of the Metabolic Bone Disease Service at Hospital for Special Surgery identified the essential role that Vitamin D plays in expediting the healing process of bone fractures. According to Dr. Lane, bone remodeling or bone tissue formation, a part of the healing process, occurs about two to four weeks after surgery. This is the critical stage when your body needs vitamin D. In the Sports Medicine Service, 52.3 percent had insufficient levels and of these, one-third of these or 17 percent of the total had deficient levels. The best advice I can give you that will expedite your return to rugby is this – As soon as you are physically capable, when you need something, get up and do it yourself. When it’s time to refill your ice pack, you do it. When you need to take your pain medicine, you get up and get it. Don’t miss any opportunity be up and around. You will not be able to do much for the first few days following surgery, but a challenge I made for myself was this. I will do one new thing today that I couldn’t do yesterday. This created for me daily psychological wins, and I was able to track my improvement with tangible activity. I became tenacious in my recovery and knew that my daily milestones would one day lead me back to the jersey that I had worked so hard for. Exactly two weeks following my leg break, I was back at the pitch supporting the boys for our final home match of the spring rugby season. It was so therapeutic for me to see the fellas, and be close to the action again. I was able to talk with the field paramedic and update her on my status and assure her that I was well on my way to a full recovery. The encouragement I received that day from the club was amazing. One thing I have learned about amateur rugby is that the effort required is massive, and most people will not make the necessary sacrifices just for their own sake – you do it for your mates. I have discovered that I will always do more, if I am doing it for someone else. In my mind, my return to rugby was becoming less about me and more about what it means for my club and the game itself. Throughout my immobilization phase, I set my mind to learning the game better. For the two weeks that I missed work, I watched A LOT OF RUGBY, and I committed my time to becoming a mental student of the game. This opportunity generated so much of an intrigue that I made the decision to complete Level 200 Training and get my Coaches Certification through USA Rugby. I still had no idea what the timetable would look like or when I would be fit to play, but I was making sure every day I was doing everything I possibly could to be mentally ready. What I would soon discover is that my successful return to rugby was going to have less to do with by body and more to do with my mind, and if I was going to win, it was going to be essential that I have my head in the game.